Sprint Nextel has changed over their internet SNPP &WCTP gateways. In order to work with the new gateway(s), customers must sign up for an account and will be given a log on account name and password to access the new gateways. An Enterprise Messaging Gateway can be obtained for no cost. The new gateways have new server addresses and require the entry of the account name (and password for WCTP) in the setup. Please go to: https://emg.sprint.com and click on the ‘Sign up now!’ button. We suggest requesting both SNPP and WCTP access. If you need any help with the process, please contact InfoRad TechSupport (Email: techsupport@inforad.com; or phone: 800-228-8998). Upon completion of the sign up process you will be given a user account name, password, and new gateway address. 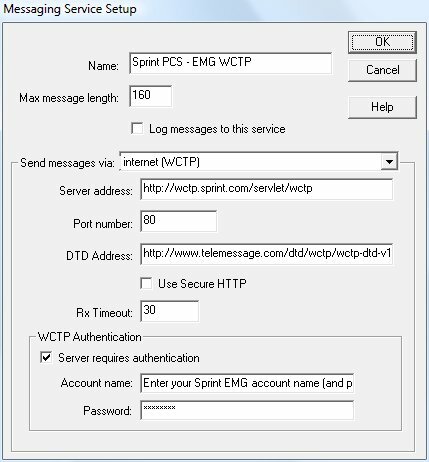 The user account name and new SNPP server address will have to be added to your InfoRad Sprint SNPP Messaging Service settings; the user account name and password and new WCTP server address will have to be added to your Sprint WCTP Messaging Service settings. 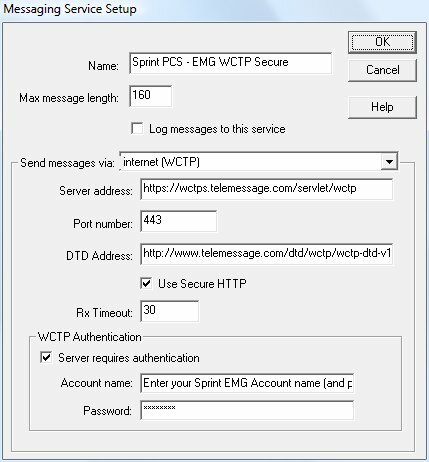 Also for WCTP please change the DTD address to: http://www.telemessage.com/dtd/wctp/wctp-dtd-v1r3.dtd. 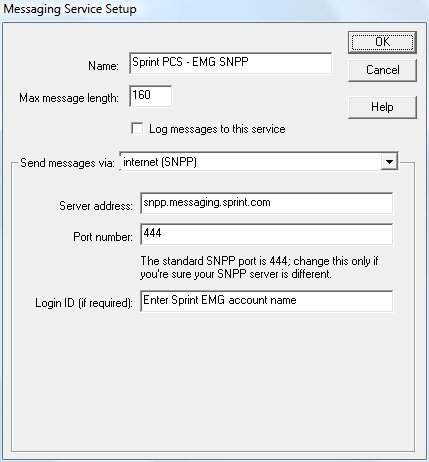 Sample screen shots and settings for Sprint EMG SNPP and Sprint EMG WCTP Messaging Services are below. Also, please see the note below screen shots on verifying your public IP address for your Sprint EMG account. Your IP address is rendered there. Click on the “Additional Details” button on that page, and in the “General IP information” section check the “Assignment” field to see if the address is Static or Dynamic. If the IP address is Static – enter the IP address on the Sprint form for your account . If the IP address is Dynamic, then your IP address will be changing each time your internet modem logs on. 2)	Ask Sprint to setup your account to not use the IP address for authentication (due to Dynamic assignment), and to setup the account to use the account name AND password for authentication.